Clay artist expresses heartfelt thoughts and feelings. 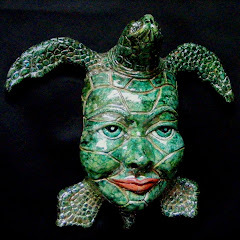 This piece was created in clay and fired using the raku process. The birth of the protector actually began when I was experiencing hurricane katrina winds for over 12 hours in our home in Gulfport, MS.So many of the trees saved us in a multitude of ways. It was the most powerfully transformative event because it forced me to move into ALL my Fears and Feel them deeply. 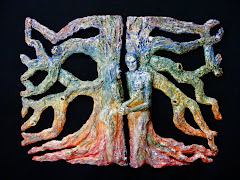 Creating this ART in clay was part of my healing and it needed to be born. Keep in mind that pieces like this may not be able to come into being under McCain and Palin. Many artists may be censured and if people do not have money to buy our ARTFUL expressions, well they may cease to be. We may all be too busy trying to grow our own food and will not have TIME for art. After all, if gas is 10 dollars a gallon, how will we import those delicious foods from California. We may actually have to purchase LOCAL stuff. Hummm. Not a bad idea, huh? 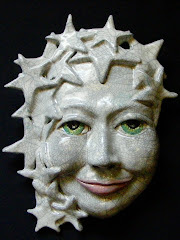 I am excited about integrating inspirations from Nature's Beauty and many life experiences into my coil and slab built clay sculptures and wallhangings. My life experiences include over 13 amazing years working as a compassionate and empathic home health registered nurse. During that time in my life, playing in clay was a joyful and healthy hobby. But life is certainly filled with beginnings and endings and I was able to recognize when it was time to move forward. Although I released working as an R.N. in the traditional sense in 1999, I believe that life has been, and continues to be an amazing healing Journey. It is certainly filled with mysteriously synchronistic events that continually reveal that ALL things are connected. 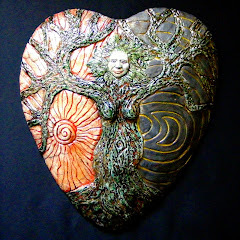 With love and gratitude, I have been weaving all of the pieces of my life together and they have formed the clay artist, teacher and story-teller that you see. This piece was inSpired by the beauty that I see and FEEL when I look up at the stars at night and know that so many other Beings all over the planet are also looking up for hope and inspiration. We are all trying to find our place on this earth while we are here on our short visits. This was actually created to help bring awareness of my simple perception of things to other people who might also be FREE thinkers that question things.